Oooh, what a mysterious title. Not really all that mysterious, but it’s late and so, you know, that’s my story and I’m sticking to it. Also, ~famous~ is entirely relative in its use here, but we’ll get to that shortly. 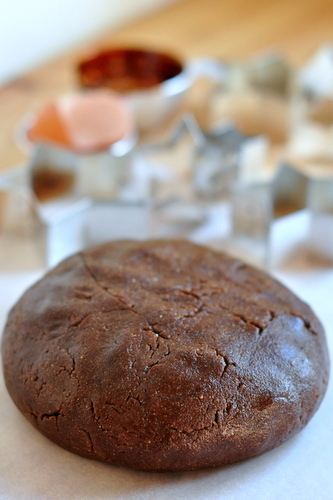 There are many things about this Gingerbread that do indeed make it extra-ordinary however. 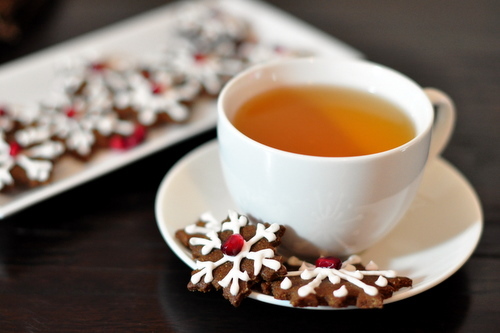 For starters it has Pomegranate seeds on it – how festive are those little buggers?! And then there is the piping – Eggnog Royal Icing. Yep, you read right, Eggnog.Royal.Icing. A miracle of my own creation and possibly inspired by the Bourbon winking at me from the kitchen cupboard. ‘Possibly’ in this instance means ‘definitely’, by the way. Oh, and how could I forget, it’s made with wholegrain flour, and a sugar change up and magical coconut oil – really now, you had to know that was coming. BTW, based on the content of the previous sentence, I’d put $10 on the fact that my brother has now stopped reading, scrolled directly to the recipe and is reciting the ingredient list out loud as his wife pulls jars and bowls out of cupboards to make this, but I digress. I remembered at about 6pm on Sunday evening – while up to my elbows in this Gingerbread – that the article was being published that day. RJ picked up a paper for me and started to scan the piece. When he said ‘oh look, she mentions 84thand3rd‘ I may have squealed, and possibly jumped up and down a little bit, or a lot, and perhaps deserted the cookies for a short while in my excitement. In any case, I’m claiming ‘famous’ because it’s my blog and I can do that. The article is lovely, if you want to have a read it’s here: For the Love of Cake. Tell me, why do you bake? 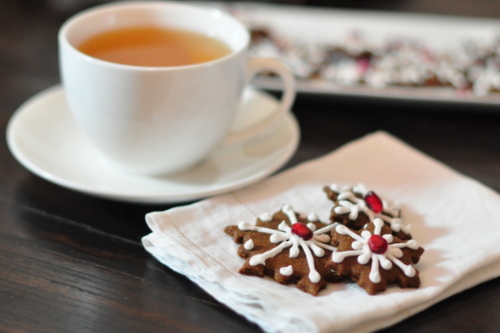 But back to the cookies, I love gingerbread, always have. When I was a kid we made gingerbread people for the Christmas tree. They would hang along side the hand-strung garlands of popcorn and cranberries [yes, hand-strung popcorn and cranberries – and people wonder where my craft gene comes from] and the red velvet Christmas ornaments, and the tinsel, winking at us all through the holidays. And of course there was always a batch for eating too! I do firmly believe they taste better as stars and snowflakes than as people shapes, and are just as satisfying without icing but look prettier with it. They also taste better when snuck from vintage cookie tins that have been poorly hidden away from grubby fingers, but that is an entirely different story for a different day. 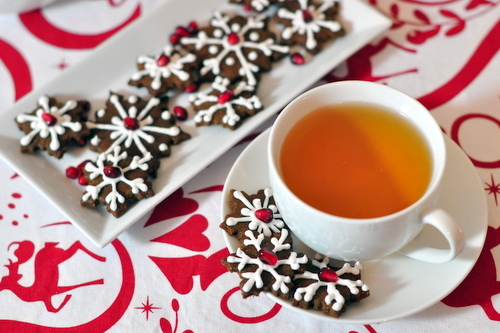 For now, gingerbread in the shape of snowflakes, that is healthy enough to justify eating twice as much and naughty enough to bring back memories of childhood. Enjoy. Pre-heat oven to 180 C [350 F]. Line 2 cookie sheets with baking paper [parchment]. 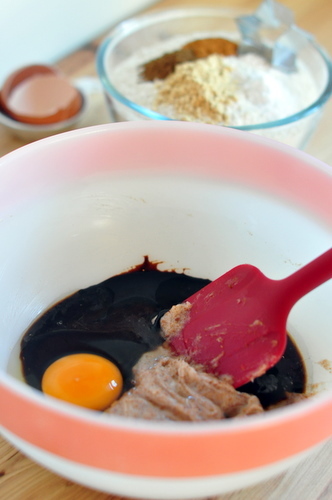 Cream coconut oil and sugar together with a wooden spoon or rubber spatula until fluffy. Beat in egg, molasses and vinegar until well combined. Sift over dry ingredients and mix well. Turn out dough and pat into a flat-ish round. Wrap in baking paper and refrigerate for at least an hour. Roll out half of the refrigerated dough to about 1/8 inch thick [approx 2 mm]. I do this on baking paper that has been sprinkled very lightly with flour. Dip cookie cutters in flour and cut out shapes. Use a small metal spatula or off-set knife to transfer to the prepared cookie sheets. Repeat with other half of dough. 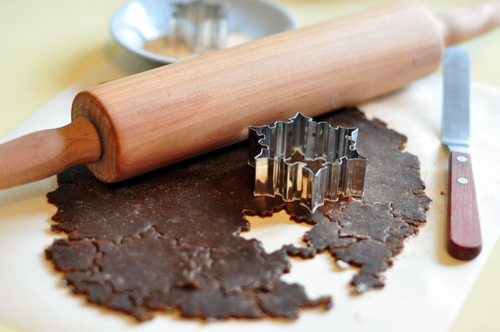 Make sure to gently press scraps together and re-roll to desired thickness for more cookies*. Bake in pre-heated oven for 5-6 minutes, turning trays once during baking. I prefer soft gingerbread so I only ever bake for 5 minutes. Remove immediately from trays and cool on wire racks. Decorate however you like. Share the love. Makes approx 4 dozen small to medium size cookies. Use bigger cutters, get less cookies, obviously. 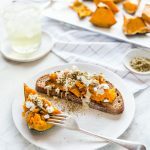 Coconut oil replaces the traditional vegetable shorting or butter in this recipe, it should be cool-room temperature and semi-solid rather than warm-room temp and liquid. The white sugar has been reduced by half and replaced with coconut sugar which is low-gi, sustainable and mineral rich, this with the molasses means the cookies are still plenty sweet. You could use regular white or brown sugar. The amount of flour you need will depend slightly on the type you use. Start with the 2 1/4 c and add a bit more if the dough seems too wet. You can always wait and use the extra while rolling out the dough. If using wholewheat instead of spelt try to find wholewheat pastry flour which is a much finer grind. My stone-ground organic stuff made for a slightly more ‘rustic’ finished product. After about 2 rounds of pressing together the scraps and re-rolling I just bake a tray of the remaining off-cuts… no way am I throwing out the left over bits, they make for a great cook’s-treat before the pretty ones get shared around! If you want to make these to use as Christmas ornaments, use a toothpick to poke a hole in the top before baking, and leave in oven for about 7-8 minutes so they get really firm. I confess that I often check in but don’t leave messages. I love your photos! They would motivate anyone to spend time in the kitchen, if not to bake, to eat. In my case, you know it’s both. This morning I am inspired by my love of gingerbread in any shape or form. Every time I make gingerbread, I am reminded of a day when some of Al’s friends made plans to come over to bake Christmas cookies together. Because Al was very much like you in the kitchen, she had her gingerbread all made and in the frig before the girls arrived. The look on her face as they unpacked the Pillsbury dough was priceless! Good thing for them, the cookie cutters were so cute. In her usual gracious style, she spent the day chatting, laughing and baking cookies with her very good friends. After they left, she got her dough out of hiding from the non-bakers and announced that now it was time to make REAL cookies. Because as we all know, it is love that makes us real. Aren’t you glad that I don’t usually leave messages?! OK…coconut sugar? I’m going to need a substitution list like the one I often refer to in my Fanny Farmer book. 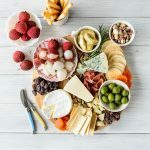 You know, for those of us who jump into action before we check the entire list of ingredients or read the recipe from start to finish at least once before starting. Congrats on your mention in the article. Now I have yet another blog to visit and drool over. I look forward to the day when we spend time in the kitchen together again. Love and thanks. 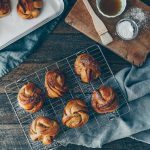 And as to the why I bake – I generally bake when I’ve got something on my mind that I can’t get to the bottom of, somehow the act of combining all the ingredients and revisiting childhood of getting good and messy seems to help me find the answers. For some reason at different times, it’s been muffins. Or bread. I have no idea why! What a great reason! It seems I bake no matter what my mood – that said I eat no matter what my mood too…huummm! great idea must try that out beats doing the garden – which is what I normally do…. Congrats 😀 love the cookies!! Congratulations on the article. And I love these cookies. They’d re so festive! I need to start using coconut oil. Hi there, thanks for your comment on my lasted cookie post. I’ve done a bit of research and from what I can find, palm sugar is from the sugar palm (Palmyra tree), palm oil is made from the oil palm (Elaeis guineensis). Sugar palms are not the problem, oil palms are. thanks Emma – that is really good to know! I like it…wholegrain and lots of molasses! I just bought some coconut sugar to try too so I think I have all the ingredients to make these! Hummm, those snow flake shapes look strangely like the stars I once had…I’m sure I passed them on to you when I moved?! They are beautiful! You were always detailed. Love you, sweetie!! I found your web site by Lee Allison and he referred to your posting here. 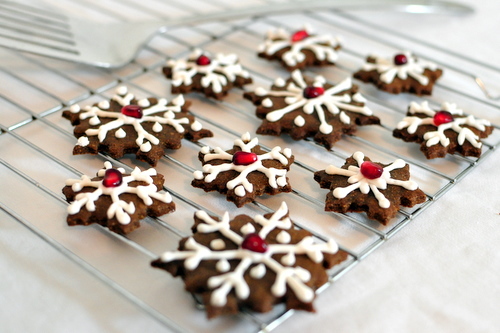 I must say your almost Victorian looking snowflake cookies are the most beautiful gingerbread I have ever seen! 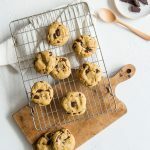 I would love you to join my online cooking magazine “Cooking Up a Storm All Over The world!” There are 156 members there that would absolutely LOVE TO SEE THESE BEAUTIFUL COOKIES! There is a section on the site, among others, called “The Cookie Jar” that you would like too. I am so happy that I found your site! I really hope you join! Can I substitute shortening for the coconut oil and get the same results? That is what I have and I have spent a ton on the edible gifts & gifts I have bought this month! Hi Polly – thanks, you can definitely use shortening, it is what I substituted the coconut oil for in the first place! Gorgeous cookies JJ! I love the way you’ve decorated the, so festive. I’ve been keen to try coconut sugar for a while. How do you find it as a substitute for normal sugar? Where do you get your coconut sugar from? Thanks Jennifer! 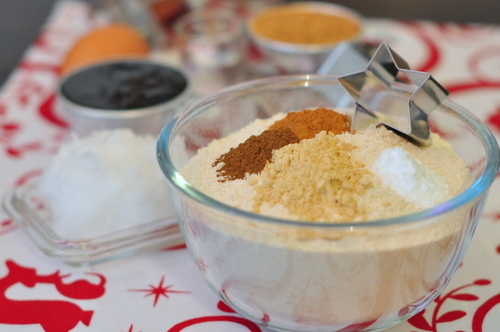 Coconut Sugar is about like using brown sugar but much coarser so it does take longer to dissolve. I find it has a more ‘syrup-y’ flavour and is not quite as sweet. I get it from my local health food/organic shop.